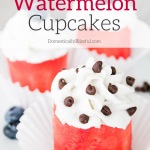 Fresh Watermelon Cupcakes are a perfectly cool & healthy way to turn fruit into dessert! Toppings – Berries, Chocolate Chips, Nuts, ect. First, cut your watermelon into thick slices & use a biscuit cutter to create the cupcake shape. Place your watermelon cupcakes in cupcake liners. Next, open your can of chilled coconut milk & scoop out the solid section on top & place it in a bowl. Whip the chilled solid coconut milk with a blender until fluffy, then add vanilla extract (I used about 1/4 teaspoon) & sweeter to taste. Top your cupcakes with coconut whipped cream & your favorite toppings & enjoy.